Does Pacquiao still need catchweights? By Chris Williams: Manny Pacquiao just let a perfectly good fight slip through his fingers with a rematch against Miguel Cotto that would have made a ton of money for him as well as for his promoter Bob Arum. One of the reasons that Cotto didn’t take the fight with Pacquiao was because of the weight requirement for the fight to happen. In other words, Cotto would have had to fight Pacquiao at a catchweight of 150 lbs in order to get the fight. Having been burned once in a catchweight fight with Pacquiao in 2009, Cotto wasn’t interested in dealing with another catchweight fight, so he wisely chose not to take the fight. 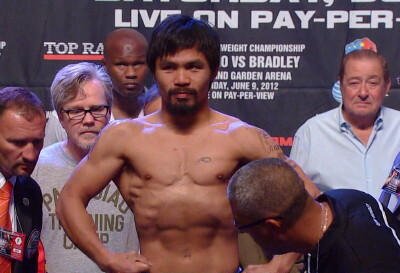 I’m just wondering does Pacquiao needs these catchweights in order to beat guys like Cotto? I don’t really understand. Pacquiao totally dominated Cotto in every department three years ago, in a catchweight fight, and stopped in the 12th round. Why would Pacquiao need yet another catchweight in order to fight a guy that he totally dominated? Can you imagine the legendary Jack Dempsey as asking for a catchweight if he were to fight a rematch against the much bigger Jesse Willard, who Dempsey stopped in the 3rd round in 1919? Willard out-weighed Dempsey by 245 lbs to 187 lbs, yet Dempsey never asked for a catchweight, and you know he would never ask for a catchweight if he were to fight Willard again. Why would he need one? He already proved that he was the better man by destroying him in three rounds. I don’t see Pacquiao as needing a handicap catchweight, do you? I don’t get it and I think it’s bad for the sport. Catchweights should be banned permanently for the good of the sport. If you’ve got a really popular fighter like Pacquiao, he can in theory say to a bigger that if he wants to fight him – and get the big payday that goes a long with it – he’ll have to fight at a catchweight. This puts the bigger fighter at a potential disadvantage if he has to melt down to a smaller weight to make the fight happen. Cotto is already wealthy, so he could say no to a catchweight request, but do you think a poorer fighter would? I don’t. This is why I see catchweights as being bad for the sport because it can lead to more popular fighters using it as an edge against guys that need a payday and probably wouldn’t say no to it. Boxing » Manny Pacquiao » Does Pacquiao still need catchweights?